Ask any millennial if they have it harder than the previous generation. More often than not, the answer will likely be yes. If you’re a part of the millennial generation, it can be difficult not to feel like you were dealt a bad hand. The things in life that seemed to come easier for your parents and grandparents seem so far out of reach. Thus, it feels impossible to stay encouraged. While many of the ways in which our world has changed are for the better, the millennial generation has been the brunt of some less than stellar adjustments. Unfortunately, financial security is one aspect of life many 20-somethings struggle with. Saving, investing, budgeting, and even cutting back can seem ridiculous when you struggle to simply pay for basic necessities. 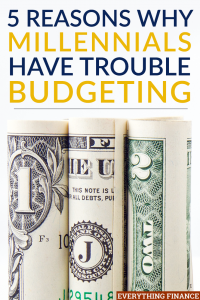 Budgeting can be crucial to one’s financial future. But for millennials, budgeting can feel like an impossible feat. In order for 20-somethings to move towards a healthy budget, it can be important to understand the challenges they face. Here are five reasons millennials have trouble budgeting. Thirty years ago you could enter a company at the bottom with little experience and work your way up to the top. Enter today, and you’ll find a much different job market. When the economy took a hit in 2008, so did the job market. Unfortunately, entry-level jobs not only require a degree, but experience to go with it. Moreover, as older generations’ jobs took a hit, millennials now found themselves competing for those entry-level jobs with experienced and seasoned professionals. Over the last few years, it seems as though more millennials have been forced to take lower-paying jobs that are usually an underemployment. Furthermore, they also likely find themselves hard-pressed to find any job let alone one that’s full-time. Without a stable work life, it’s difficult for millennials to focus on a budget when their salary barely gives them enough to support themselves. You’ve likely heard about the rising cost of college tuition, and if you have, you know that many millennials leave their academic careers drowning in thousands of dollars in student loan debt. In other words, even though continuing your education is supposed to benefit your finances long-term, many students start life off already financially behind. Depending on how far you go with your education, a student’s debt can average anywhere from $30,000 to $100,000. Combine the mounting debt with the lack of high-paying jobs and trying to stick to a budget can seem useless. Large student loans likely means that that’s what a significant portion of your budget is going to. Unfortunately, it’s all too easy to give up on your budget when it doesn’t seem like you’re making a dent towards that debt. Reading, writing, and arithmetic are key subjects in most academic curriculums. However, the topic of finance rarely makes the list. Many 20-somethings don’t receive any knowledge or education regarding personal finances until they’re forced to deal with such matters upon leaving home. That being said, if you know nothing about it, it’s not necessarily an easy topic to always handle on one’s own. This lack of experience or knowledge is why so many millennials have trouble budgeting. They might find it difficult to know where to begin or to know how much of their income to allocate to various categories, which again, makes sticking to your budget or properly managing your funds a bit of a challenge. To combat this, try reading some of the most popular personal finance books. They’re sure to help you get over your budget struggle. Our culture is all about appearances. Hollywood and the rich have perpetuated a lifestyle that everyone seeks to imitate. Unfortunately, the majority of the population fails to have the means required to keep up such appearances. But many force themselves to do so through the use of credit cards, only serving to dig themselves deeper in debt. Millennials grew up during the peak of this culture. They constantly seek to possess what they’re friends and those they see on television have. No one wants to seem like the cheap or broke friend. This is why many 20-somethings often spend more of their income on entertainment and extraneous items, completely ignoring their budget, when that money should be put towards more important matters. When you live in a society where everyone tries to keep pace with one another, throwing your budget out the window, or simply failing to create one in the first place, is all too easy. Between debt and underemployment, millennials are the generation that can’t support themselves. Many articles and studies have been published discussing the fact that many millennials live with their parents well into their late twenties. Without the proper means, many millennials struggle to establish themselves as financially independent. Moreover, many parents don’t charge their adult children bills or rent. Since they don’t have to worry about bills or rent, there’s no reason for millennials to separate out their income. They don’t have to ensure that there’s enough since it can all go to other things. When you don’t have to focus on putting your money towards living expenses, it can be challenging to get in the habit of budgeting. After all, living at home can make you feel like a bit of a teenager at times. It can also cause you to think that you make more than you really do, which can cause you to utilize your money in a similar way. Sticking to a budget can be challenging for well-established adults. Consider the fact that many millennials struggle to financially and professionally establish themselves in the first place. Thus, it’s easy to understand why many millennials have trouble budgeting. Nonetheless, no matter the societal and generational obstacles in many 20-somethings way, creating and following a proper budget is the surefire way to ensure future, financial success. Do you think millennials have trouble budgeting? Why?